Greasy floors are slippery, dangerous and difficult to clean. 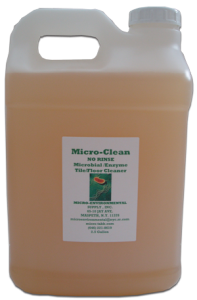 MICRO-CLEAN contains bacteria and enzymes to jump start the attack on grease and oil, as well as targeted bacteria and organic compounds that complete the cleaning process. This approach results in a turn-key product that provides quick initial results with subsequent continuous cleaning and deodorizing. Chemical cleaners simply spread the slippery grease around, doing little to eliminate it. MICRO-CLEAN deep cleans, removing embedded residual grease and organics especially in porous tile, cracks, crevices, and corners. MICRO-CLEAN continues to work when washed down the drain, digesting grease and organics as it flows through the pipes into the sewer or septic system where the bacteria continue to remediate fats, oils, greases and other organic matter. MICRO-CLEAN contains no chlorine, phosphates, or other potentially harmful chemicals, and is safe for humans, animals, and the environment when used as instructed. Degrades grease and organic buildup. Great for hard to clean porous tile. Step 1. Wipe up any spills and sweep floor. Step 2. Fill mop bucket with cool water. Step 3. Add 2-4 ounces of MICRO-CLEAN per gallon of water. Step 4. Using a clean mop, apply solution to floor. Step 5. Allow to air dry. Do Not Rinse. Wear eye and skin protection. Wash hands after handling. Avoid discharge to natural waters. Small spillages can be washed away with large amounts of water. Large spillages, if contained, can be returned to container. For disposal of aqueous surfactant solutions: Aerobic biological effective in treating aqueous solutions of surfactants. Removal efficiency will depend upon treatment plant conditions. As with any wastewater, consultation with local treatment plant staff is recommended (and may be required by law) before disposal. In typical activated sludge treatment systems, inlet concentrations below 50 mg/l have been treated without foaming problems. 2 – 2.5 Gallon per case (net contents 5 gallons per case). Store MICRO-CLEAN in accordance with local regulations. Store in original container protected from direct sunlight in a dry, cool and well-ventilated area. Do not freeze or heat above 110°F. Keep away from incompatible materials (See MSDS) and food and drink. Keep container tightly closed and sealed until ready for use. Containers that have been opened must be carefully resealed and kept upright to prevent leakage. Do not store in unlabeled containers. Keep away from children. The information presented is correct to the best of our knowledge; however, no warranty is expressed or implied other than the quality of the product described. No recommendation to infringe on any patented or proprietary procedures is intended. Each user of Micro Environmental Supply Inc. products should review this information and these recommendations to determine their relevance and applicability in the specific context in which the products are to be used. Micro Environmental Supply Inc. provides our customers with a product specific Material Safety Data Sheet (MSDS) to cover safe handling, storage, potential health effects, use and disposal information. Micro Environmental Supply Inc. strongly encourages our customers to thoroughly review the MSDS on our products and other materials prior to their use. Call for pricing & shipping information. Contact Us for a full list of distributors or to apply to become a distributor. © 2017 Micro Environmental Supply Inc.